Most baseball fans know that this year's All-Star Game will take place in Cleveland, Ohio and that next year's will be played in Los Angeles, California. After that, though, future sites had remained unannounced. 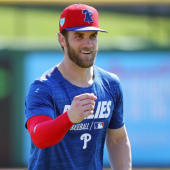 PHILADELPHIA - Commissioner Robert D. Manfred, Jr. announced today that Major League Baseball has awarded the 2026 All-Star Game and accompanying All-Star Week events to the Philadelphia Phillies. Baseball's Midsummer Classic will be held in Philadelphia for the celebration of the 250th anniversary of American independence and follows suit from 1976, when Veterans Stadium hosted the All-Star Game in the year of the nation's bicentennial. The announcement was made during a fan and media event in historic Philadelphia, with Independence Hall as the backdrop. Current and former Phillies All-Stars participated, as well as state and city dignitaries. The 2026 All-Star Game - which will be Baseball's 97th Midsummer Classic - will mark the fifth time that the City of Philadelphia will host the event, including the first ever at Citizens Bank Park, the Phillies' home since 2004. Shibe Park staged the Midsummer Classic in 1943 (hosted by the Philadelphia Athletics) and 1952. In addition to 1976, Veterans Stadium was the site of the All-Star Game again in 1996. It's easy to see what MLB is doing here -- in plain terms, they want to help celebrate America's 250th birthday. As such, expect myriad stars and stripes and attempts at patriotic displays and reminders that baseball is technically the country's pastime. Let us be the first to hope that we'll also get another Bryce Harper appearance in the Home Run Derby.